Beginner Instruction, no experience necessary. Equipment provided, one-on-one instruction at a local lake. $60 (prepaid) per person ($50 for AMC members) includes instruction and dinner. Must be able to swim. To register, click Register Now (above). Trip leader is the Chair of the AMC-Boston Windsurfing Committee and has led beginner training trips for 15 years. Beginner Instruction, no experience necessary. Equipment provided, one-on-one instruction at a local lake. $60 (prepaid) per person ($50 for AMC members) includes instruction and dinner. Must be able to swim. To register, follow registration link below. Stay in 4-bedroom house (Island Mist) on the shore of Pamlico Sound. Provide your own transportation and equipment. (Rentals are readily available.) Housing cost $375 ($350 for AMC member) pp. Share cooking and cost of food. Water is warm and shallow (3-5 feet deep for more than &#189; mile out). Usually a mix of strong and light winds - great for beginners or advanced sailors. This location on the Outer Banks is widely considered to provide the best flat-water sailing in the East. The water is waist-deep to about a half mile out, and it's chest-deep to about a mile out. Trip leader (Steve Sevcik) is the chair of the AMC-Boston Windsurfing Committee and is the trip leader for the AMC Windsurfing beginner training clinics. Stay in 4-bedroom house (High-Wind Lookout) on the shore of Pamlico Sound. Provide your own transportation and equipment. (Rentals are readily available.) Housing cost $325 ($300 for AMC member) pp. Share cooking and cost of food. Water is warm and shallow (3-5 feet deep for more than &#189; mile out). Usually a mix of strong and light winds - great for beginners or advanced sailors. This location on the Outer Banks is widely considered to provide the best flat-water sailing in the East. The water is waist-deep to about a half mile out, and it's chest-deep to about a mile out. Park on one of the side streets as there is no parking on Marked Tree Road Meeting follows dinner. Jan Soma is the most recent Past Chair of the Windsurfing Committee. Beginner Instruction, no experience necessary. Equipment provided, one-on-one instruction at a local lake. $60 (prepaid) per person ($50 for AMC members) includes instruction and dinner. Must be able to swim. 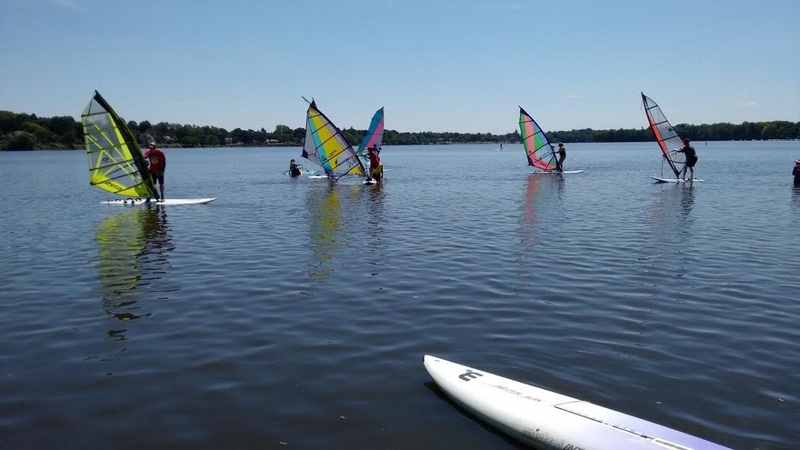 To register, send email with name, address, phone #, and any previous windsurfing experience to leader: Steve Sevcik. Leader is the chair of the AMC-Boston Windsurfing Committee.